I come from a family that uses manmade medicine as a VERY last resort and my grandma Barb is the queen of all things natural, especially natural medicines. She grows her own natural remedy plants in her cute little backyard garden and there is alway some kind of wild homemade tea brewing on the stove. Whenever anybody in the family has some kind of ailment she is usually the first person we call for a natural cure. She retreats to her bedroom of herbal cure books and notes and comes out with a recipe that always works wonders, like this homemade cough syrup recipe. 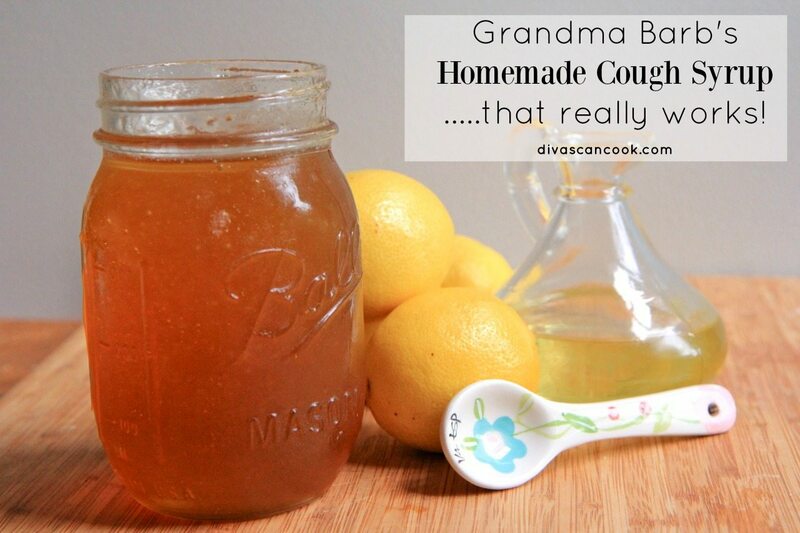 Everyone in the family has this homemade cough syrup recipe because it really does work, not to mention it’s natural with just three powerful ingredients; honey, olive oil and lemon juice! This homemade cough syrup recipe is GREAT for kids over the age of 12 months. Isaac has only had two colds so far and this recipe does a great job with soothing sore throats and coughing, especially with that nagging night time coughing. There aren’t too many cold medicines on the market for kids under 4 anyway. My grandmother uses only 1 lemon in her recipe but I like to use as many as I can stand since lemons are so good at combating colds and really helps to balance out the sweetness of the honey. Also my grandmother stores this cough medicine in the refrigerator but I store mine in the cupboards. Watch me make this homemade cough syrup from start to finish! Add honey, olive oil and lemon juice to a small pot. Heat over medium heat just until steaming, stirring. Place into a jar with a lid. Take 1 tablespoon warmed as needed. Perfect recipe. helped my sore throat immediately. Thanks for this how long can it keep in the fridge? I used this a while back and I forgot to print it out. I am so glad I came across it again. Thank you for the excellent home remedy. It works really well. I love it. How long can this be stored? Made this last night for my two year old and it worked like a charm … coughing was so much better and he slept through the night. Woke up this morning in a great mood! Thank you!